Have you heard of Panel Syndicate? I’m thinking there is a good chance you haven’t. Panel Syndicate is the brainchild of Marcos Martin whose name you may not recognize but he has illustrated a lot of super hero funny books over the years including Batman and Spider-Man. His usual partner in crime is one of our favorite writers here at Gabbing Geek, Brian K. Vaughan. Vaughan’s credits are vast but notably include Y: The Last Man, Saga and of course working on Ryan favorite, Lost. The concept behind Panel Syndicate is simple. These talented folks create comics for free and post them on the site for anyone to download. The “catch” is, you pay what you want for it. Could be nothing, or $5 or $500. Whatever you want to contribute. One of the posted series caught the eye of Walking Dead creator Robert Kirkman who is also one of the biggest wigs over at Image Comics. He wanted to do a print version of the Panel Syndicate series The Private Eye. Vaughan and Martin agreed to a print version if Kirkman allowed them to write a story in the Walking Dead universe. Kirman agreed, and The Walking Dead: The Alien was born. More on this one-shot, complete with spoilers, after the break. Let’s begin by looking at the title of this story. “The Alien”. After reading the book, to some it may invoke similarities to Matt Damon being “The Martian”. But to those with more familiarity of the more obscure aspects of Walking Dead lore, it conjures up some different trains of thought initially. “I wasn’t willing to accept no for an answer. And so I said, ‘Oh, well, I forgot to tell you that this is actually a big setup for an alien invasion.” As Robert [Kirkman] pitched it, the zombies have been created by an alien race because the aliens want to take over Earth and they want to wipe out humanity first. Over the course of the zombie story, he’d be laying these hints to the aliens. So Eric Stephenson pitched Robert’s alien story to Jim Valentino, who was more amenable to the idea since he didn’t think the alien angle had ever been done. And so they accepted the book, based on the aliens. Once three issues had come out, Eric praised Robert for getting him to read a zombie comic, although he wondered where the alien Easter eggs were. Robert just laughed and said there is no alien invasion! He just made it up. “So yeah, I kind of tricked them into accepting The Walking Dead,” he said. As a riff on this, for the 75th issue Kirkman published an “alternate ending” which saw Rick Grimes receive a blow to the head and wake up alone in a hospital bed, similar to the beginning of the series. But now, the full scale alien invasion had begun. Aliens were everywhere and Grimes and his friends like Tyreese were being turned into super soldiers and Michonne was now wielding a light saber instead of a katanna. This of course was all in good fun and is not considered canon. Luckily, The Alien has nothing to do with aliens from outer space. The title refers to an alien in terms of a visitor from another country. As we find the title character to be an American who is stranded in Spain when the apocalypse begins. Which in itself is very interesting as I think it confirms for the first time in the comic universe that the walkers have spread worldwide and are not just relegated to the small portion of the US that has been seen so far. The story is decent enough. Vaughan and Martin hit all the right notes and this book will not feel out of place at all in your Walking Dead collection. Except maybe for the fact you can only get it digitally right now. And that it is designed completely in widescreen. Think of it as taking your printed copy of a comic and turning it 90 degrees and reading it that way, flipping the pages up instead of to the left. Something else that happened a long time ago was that Kirkman declared that we would never see Jeff Grimes appear in The Walking Dead. Some people will say now that he hasn’t stuck with that, but I’m sure Kirkman was talking about the main book, which is always moving forward. Little did he know 10 or so years ago that this little gem of a book would present itself. And before you dismiss it, the story is official Walking Dead canon according to Robert Kirkman on the twitters. Vaughan has also said as much in interviews saying that Robert gave him free reign to do whatever he wanted in the Walking Dead universe. Jeff’s story was something that has intrigued him since that forgettable mention. If you are a fan of the Walking Dead comic, you should definitely head over to Panel Syndicate and pick up a copy. Donate what you can to show your appreciation to these fine gentlemen and to keep the content flowing. 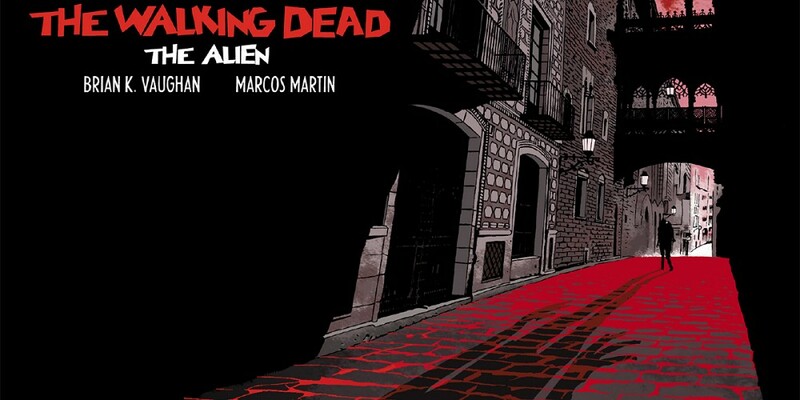 Hopefully sales and word of mouth will encourage Kirkman, Vaughan and Martin to launch another similar project.